BART’s ridership is booming. On a typical weekday, BART carries 423,000 passengers – an increase of 26 percent since 2010. While BART’s crowding problems during commute hours are well documented, packed trains are now common well beyond commute hours. During nights and weekends, trains through the Transbay Tube are routinely at crush capacity, especially on Friday and Saturday nights and on Sundays. While BART’s rush hour capacity is limited by infrastructure constraints, its crowded night and weekend trains are a product of limited service. On Sundays, weekday evenings after 6pm, and Saturday evenings after 6pm, BART service is reduced to operating at 20 minute headways on three lines (Yellow, Blue, and Orange) while it does not offer service on two lines (Red and Green). During these periods, BART service does not meet best practice standards for frequent metro service: it is well documented that frequent transit service that arrives every 15 minutes or less is critical to fostering a transit-oriented lifestyle that allows for spontaneous travel without planning around a train schedule. Instead, frequent service is only achieved in select pockets between Daly City and West Oakland and for a few stops in Oakland/San Leandro. The lack of frequent all day BART service has far-reaching consequences. People who do ride are greeted with long waits and crowded trains. Many others instead choose to drive – Sunday afternoon traffic on the Bay Bridge is often as bad as weekday traffic. For many areas, the lack of bus and BART service during nights and weekends represents a major barrier to mobility, resulting in higher rates of car ownership than would otherwise occur. For these reasons, BART lags behind its peer systems across the country in supporting transit-oriented lifestyles for riders whose travel needs extend beyond typical commute hours. BART service during nights and weekends hasn’t always been this poor: service was cut back from 15 minute base headways to 20 minute base headways in 2010. 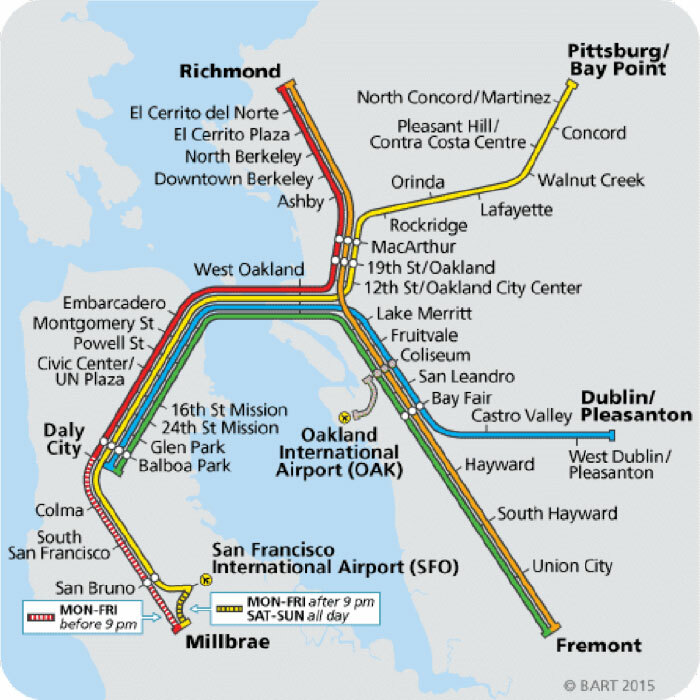 Since then, service has slowly been restored – BART’s recent service expansions, for example, extended more frequent service later into the evenings, but stopped short of restoring 15 minute base headways due to insufficient funding. As the Bay Area’s population continues to grow, and traffic continues to worsen, one would hope that BART will once again offer frequent service regardless of time of day or day of the week. Until then, if you need to ride at night or on Sundays, it’s best to consult a schedule first.